Membership Based - It allows the owner to sell memberships to the portal and include a wide array of member benefits to build value for membership. Dynamic Content - Using only a browser an mouse, the owner can brand the portal, add and move dynamic content or completely redesign the portal. An eCommerce Website – includes Member Services area, member only pages, personalized start page, localized with news, weather and yellow pages to each zip code, automatic provisioning of services and much, much more! Membership Portal – each membership includes up to five (5) email accounts (webmail and POP3) with the best anti-spam web-based software in the industry, free personal website with Web Creator web-based software and 24/7 technical support through toll free telephone number or email. Administrative Center – that allows you to manage the eCommerce Website, add new pages and elements, create new accounts, view members and a host of many other things! Internet Control Panel – a complete and automatic billing system with automatic provisioning of services that accepts credit cards, check cards, debit cards, checks and cash. Many unique and useful features. Merchant Account – includes a shared merchant account through which credit card, check card and debit card payments are accepted. Includes complete administration. Marketing Support Website – Includes hundreds of sources of free content, specialized elements that can be added to eCommerce Website, free software, marketing ebook library and much, much more! 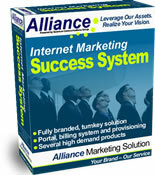 Optional Marketing Software – Those that desire can utilize the multi-tier affiliate program software. An optional plug-in module that provides each affiliate with their own website, tracks genealogy, calculates commissions and writes checks. Optional High-Demand Products – You can sell any or all of our products listed above and possibly products you secure elsewhere. Not only does the Alliance Success System provide its users with many individually customizable applications and content feeds, each user has the ability to structure the physical layout of the portal to fit their desires. Also, the versatile administration tool enables portal operators to control the default settings of their dynamic portal. You drive your marketing strategy. While others offer you parts and pieces, we give you a completely branded turnkey Success System! If you would like more information on our Alliance Success System, membership-based dynamic portal, simply click on "INFORMATION" to request it. Our "Auto-Reply" feature will have the information back to you within seconds.